As we celebrated our largest group of graduating students to date on Mother’s Day, we saw in them an impatience to make their mark, joined with sincere humility about their role in the world. It is their humility, reflecting both the liberal arts core of our education and a Midwestern ethos that will serve them well as they continue to grow through ongoing learning. But however humble, they are also impatient with the inequities of our society. Many of them support a surprisingly successful “democratic socialist” presidential candidate who demands an end to growing inequality. In philanthropic circles recently, there have been more initiatives examining and seeking to improve the diversity of decision makers in positions of power, donors using their giving to address social justice issues, researchers recovering overlooked stories of philanthropy in historically oppressed communities, and affinity groups working to bring more difference into the often homogeneous ranks of professionals on both the giving and the asking sides of our civil society. But the fight for inclusion I see in our students is not only about correcting historical and ongoing inequities. It is also an open process of discovery, a continuation of their education as they figure out how to proceed on a journey without a certain destination. It is as if they tell us that we do not yet know the exact shape and dimension of a more inclusive world, where every person, and every kind of person, develops their talent to its full potential, and has it recognized by others. But it is imperative that we fight for it, not only for those not yet included, but for all of us. Now, many people we read about in the news have not embraced the kind of humility we see in our students when it comes to debates about inclusion, but they should. Absolute certainties are not fertile ground for learning. One promising development in this light has been Jim Shelton’s appointment to lead the educational efforts of the Chan-Zuckerberg Initiative. It reminds us of the virtue of humility and the challenging work of inclusion that remains ahead of us. Jim’s background spans the worlds of the Bill & Melinda Gates Foundation, the U.S. Department of Education (from where he also led the My Brother’s Keeper initiative, aimed at increasing opportunities for boys and men of color, on behalf of the President), as well as the ed tech space. He straddles the establishment where expertise builds on time-tested knowledge and the world of rapid technological innovation that declares its impatience with incremental processes to improve social outcomes. It is not only Jim’s own humble approach, but the embrace of learning from the past that demonstrates an openness and an interest in learning, not dictating solutions. This answers critics worried about the impulse demonstrated by some newly wealthy philanthropists to sweep away a lot of what is being done in the name of philanthropy and recreate it from scratch. For those of us who see the advance of learning and knowledge as the engine of civilization, that fine balance of curiosity and passion to act is vital for progress. We are fortunate that our times are not paralyzed by doubt, but at the same time uninformed passion to act can be dangerous and destructive. So it is a welcome sign that the Chan-Zuckerberg Initiative has brought on board a leader with established expertise, openness to learning, and the kind of impatience needed to drive change. So with the Chan-Zuckerberg Initiative work on education, we have not only the anticipated focus on technology in learning, but also the focus on addressing poverty and illness as conditions that stand in the way of learning—depriving all of us when everyone cannot realize their full potential. This is the kind of fight for which our students are well armed. 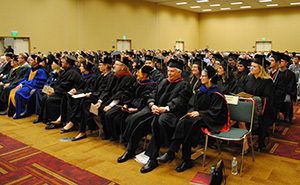 A record 66 men and women were graduated from the Lilly Family School of Philanthropy during its May 8 commencement, the largest number of graduates in the history of the school and its predecessor, including the largest number of bachelor’s degree recipients (18) to date. Social justice, access to education, diversity, healthcare, sharing the joy of art, and preserving the environment are among the causes animating those who received Ph.D., Master of Arts, and Bachelor of Arts degrees or graduate certificates in philanthropic studies. 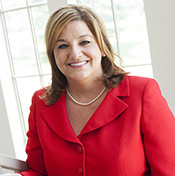 IU First Lady Laurie Burns McRobbie earned an M.A. in philanthropic studies degree and was hooded by IU President Michael A. McRobbie. Each spoke briefly at the ceremony. 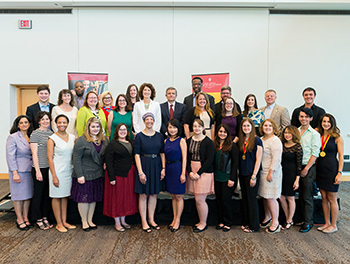 The IU Graduate and Professional School’s Elite 50 students list includes M.A. recipient Le Yang. M.A. alumni Wyatt Jackson and Melanie McKitrick also were honored on the list, as each pursued an additional degree. The William M. Plater Civic Engagement Medallion was awarded to B.A. recipients Brittany Florentine and Stephanie Fulk, and M.A. recipient Adrienne Nordman. The Undergraduate Chancellor’s Scholar for the school is Jonathan Ferguson. An IUPUI Women’s Leadership Award was presented to B.A. recipient Taylor Dooley. Dooley and Abe Roll participated in the Honors College program and were graduated with honors. “Working in the field of philanthropy means that you will fight for someone else’s needs and rights before you are satisfied. That is the truly remarkable and purposeful life you will lead,” 2016 commencement keynote speaker Derrick Feldmann told Lilly Family School of Philanthropy graduates on May 8. “The titles you get will never explain the transformative power you will have on other people. Titles won’t explain the challenges, failures, successes, and beliefs you have for the sake of another – and someone you may never even meet,” he said. 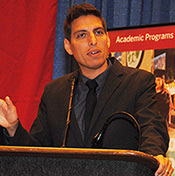 A 2004 alumnus of the school’s master’s degree program, Feldmann is founder and president of Achieve, founder of the MCON national conference on Millennials and social good, and creator of The Millennial Impact Project. “The idea of doing something good is a popular notion,” Feldmann said. “Couple that preference to do good with new technology tools to feed on that impulse to act for others, and it seems like a perfect storm of taking our interests to action for causes. Yet we don’t see the hype and desire matching the action necessary for social change. Paula Jenkins, a 2016 graduate of the master’s degree in philanthropic studies program, is already implementing valuable insights she gained. “This has been an incredible journey and is one of the best decisions I have made. Ever. As a seasoned practitioner, I was interested in gaining more knowledge about the philanthropic aspects of the sector. What I received in return was so much more than that,” Jenkins said. Apply the latest data and information from Giving USA 2016 to strengthen your fundraising planning and success at The Fund Raising School’s “Leadership Roundtable” June 23-24, 2016, in Indianapolis. Participants will be able to purchase the Giving USA 2016 report at a 30 percent discount. The Leadership Roundtable will conclude with a half-day session featuring a panel of experienced fundraisers from various segments of the charitable sector, addressing common challenges and issues faced by event participants. The registration fee is $599 ($399 if you have earned the Certificate in Fund Raising Management or an academic degree from the IU Lilly Family School of Philanthropy or the Center on Philanthropy at Indiana University). 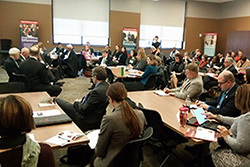 Learning from top German professors and researchers and visiting state and federal agencies, policy institutions, local nonprofits, think tanks and philanthropic foundations are among the opportunities presented. During the two-week program, students explore the role of civil society in the country and examine the interaction of German public policy and nonprofit organizations, as well as innovative partnerships between the two sectors. The program is led by Dr. Gregory R. Witkowski, associate professor of philanthropic studies at the school and an expert in the history of philanthropy and state policy in Germany. Students are sharing their experiences via a blog during the May 15-28 journey. 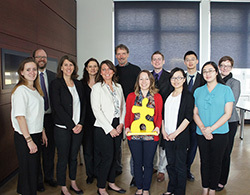 Indiana’s robust German philanthropic heritage was the focus of Markus Bierkoch, a master’s degree student at the Free University of Berlin who received a prestigious German Academic Exchange Service Grant to study at the Lilly Family School of Philanthropy during the 2015-2016 academic year. His exploration of civil society during his time at the school included a paper on German-Americans in Indiana and their philanthropic giving before, during and after the First World War, and work on his thesis, which looks at an independent society called "free thinkers." In February, he presented his work on German-American Donation Campaigns during World War I at the statewide Hoosier Philanthropy Conference celebrating Indiana’s bicentennial.